North Adelaide’s famous Hawaiian and Japanese fusion restaurant, Beach Bum, has settled in well to the beachside area of Brighton. We headed over to celebrate Chef, Nathan Liu’s, Autumn Flavours Experience, tasting various selections from their delicious autumn menu. The relaxed social event, hosted by Grays PR, was all about sharing the love through food, while trying new dishes. 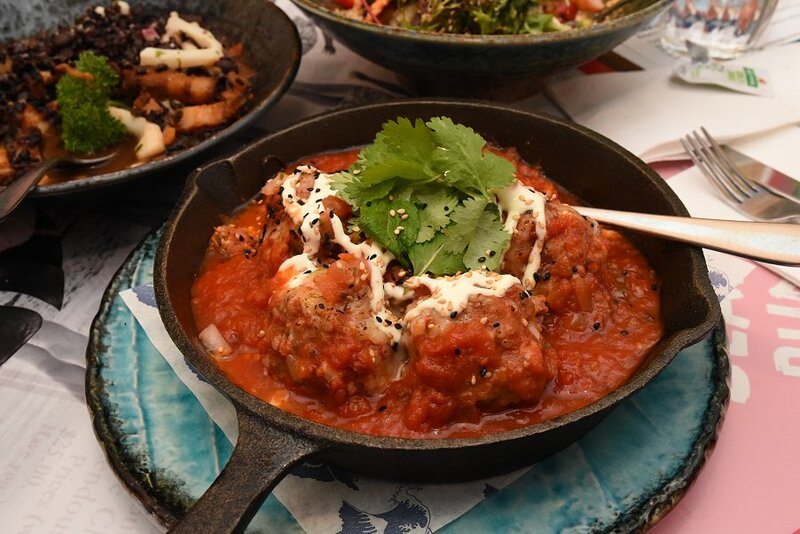 Beach Bum specialises in Japanese cuisine, mixed with Mexican and Hawaiian influences to create a unique and delicious selection of dishes. The eye-catching interior, gives off a lovely beach theme with wooden décor, a hanging surfboard and lush green plants to lift the space. The restaurant gives off holiday vibes, with beautiful dishes and cool, vibrant cocktails, helping guests to escape and relax in their own backyard. Upon arrival we were served a delicious array of cocktails, mocktails, beer and wine before being presented with our entree dishes. 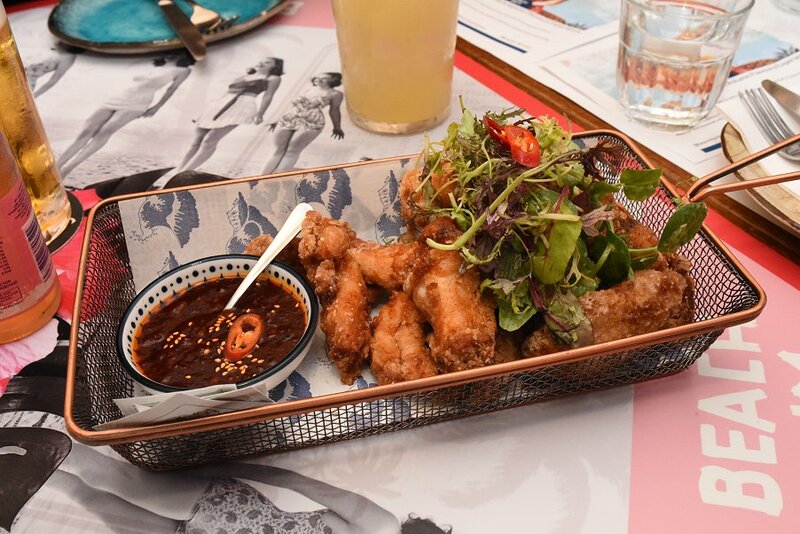 Japanese Cowboy is Japanese style fried chicken, with customer’s choice of wings or thigh, as well as flavourings of hot and spicy or soy and ginger. We ended up having the wings with a spicy dipping sauce. The wings were cooked perfectly; lovely and tender with delicious spices and seasonings mixed into the crunchy batter that gave a lovely texture balance. A thick soft heat came from the accompanying sauce, which sat on the tongue but wasn’t too spicy, just enough to kept you wanting more. The Japanese Cowboy was a delicious way to start our evening. The Gyoza we had, were pan-fried Japanese-style spicy pork dumplings served with Ponzu sauce. The lovely soft wrapping was cooked perfectly and had a lovely eye-catching pink hue that held a slightly spicy centre. 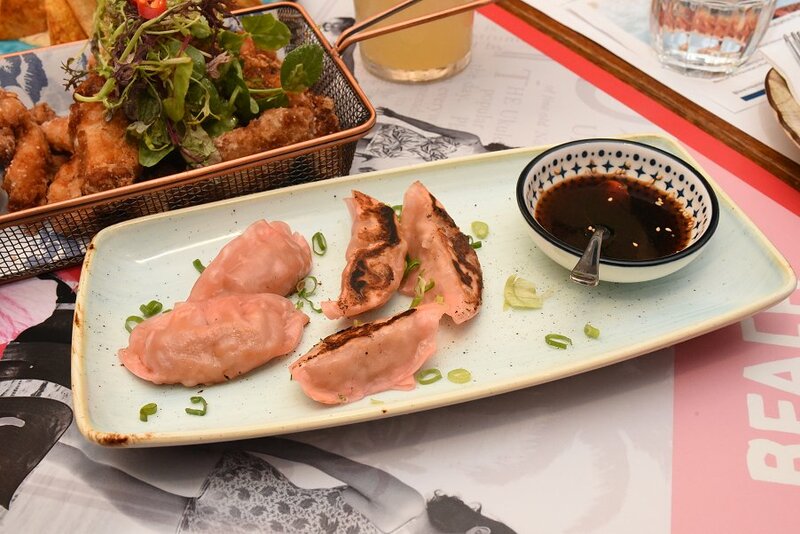 Even though the Gyoza parcels were small, they were packed full of flavour. The pork was cooked perfectly and the smooth Ponzu dumpling sauce paired perfectly, balancing the salty and savoury flavours. 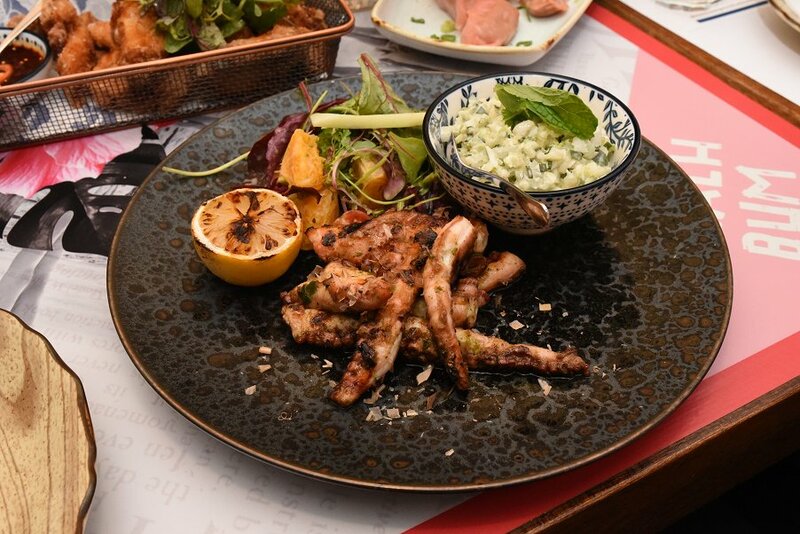 The Chargrilled Octopus was served with homemade kewpie tartare sauce, bonito flakes, basil oil and charred lemon. The octopus was cooked perfectly. Not at all stringy like it can be, it was nice and tender with a prominent smoky flavour from the chargrill that paired perfectly with the octopus meat. A lovely fresh crunchy salad balanced the deeper flavours and lifted the palate. The sour tang of lemon paired with the smoky octopus was a lovely balance of flavours. 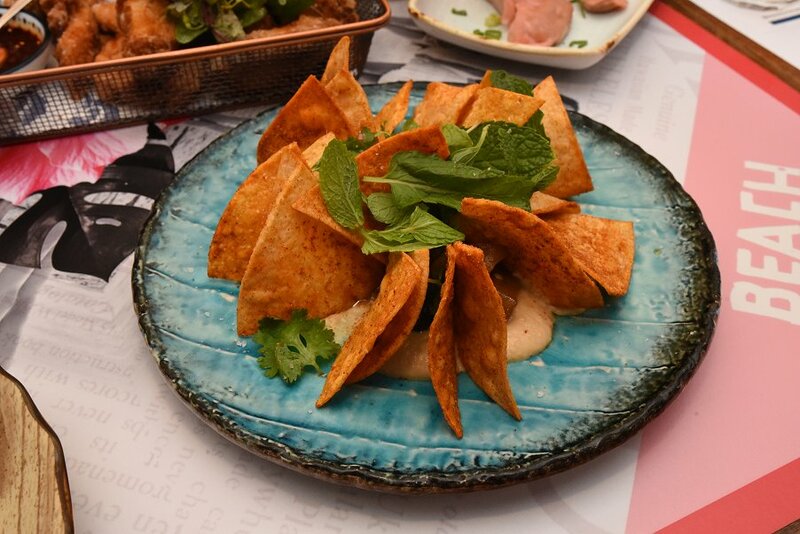 Diamond Head Dip is pan-fried eggplant and king oyster mushrooms in a black bean sauce with miso hummus, pomegranate, herbs, chilli and crunchy tortilla chips. The fresh eggplant and mushrooms were a beautiful cool balance with the crunchiness of the nacho chips, while the lovely miso hummus was very smooth and creamy and held rich earthy tones that balanced with the sweet pop of pomegranate. The rich deep flavours of the dish balanced out with the cool and refreshing eggplant and pomegranate seeds, making it a very refreshing dish overall. For our main course, we tried the Salmon Aburi. 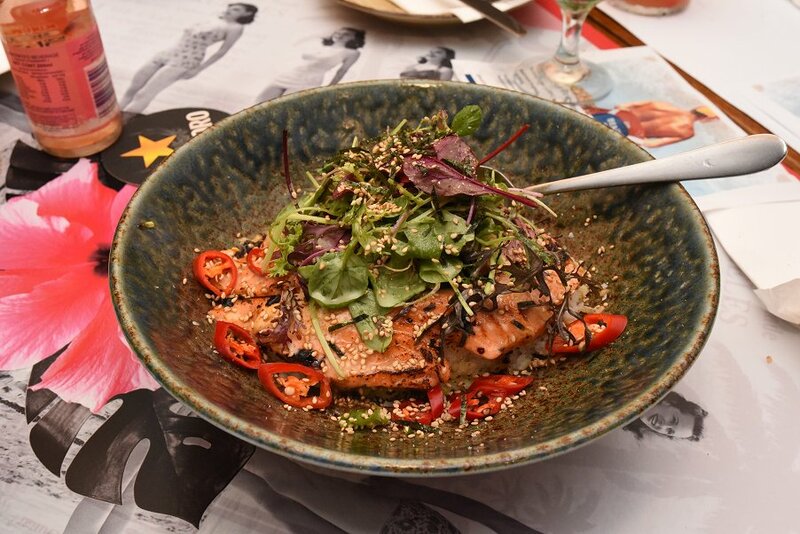 The seared king salmon was served with a teriyaki glaze, sushi rice, fresh avocado, kewpie mayonnaise, salad and fresh chilli. Before we even took a bite, the aromas from the dish, paired with the presentation, made us want to dig in. The salmon was well cooked; the flame-seared element gave a lovely exciting flavour to the king salmon, with lovely raw components as well as a delicious smoky flavour. The sushi rice was delicious and fluffy, mixed with the fresh avocado that lifted the flavour. The fresh chilli added spice, while the sesame seeds sprinkled on the top added a lovely nutty hint that tied the dish together. The Mexican Style Black Bean Stew was a new dish that wasn’t even on the official menu yet. With pork belly, squid, tomato salsa and black rice, the dish was packed full of flavour. 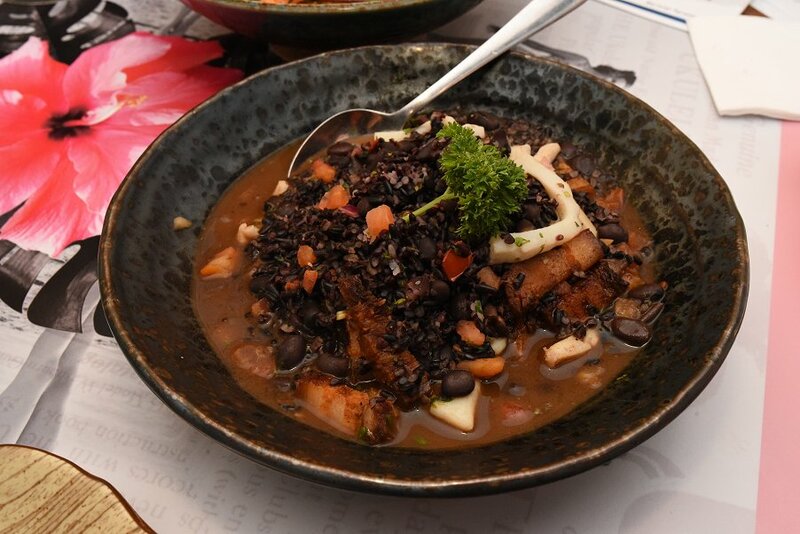 Prominent savoury earthy tones were the base of the dish, while the black beans gave a mild sweet tang. The tender pork belly was full of flavour that paired nicely with the soft squid flavour. Balancing flavours of earthy tones with the sea, lifted from the strong black bean stew. This dish would be prefect to warm guest for the coming cooler autumn days. The Beach Balls are veal and pork meatballs with habanero tomato sauce, queso, sour cream and tomato salsa. This dish was amazing and bursting with flavour. The large meatballs were cooked perfectly and had the prefect balance of veal and pork. The lovely deep meaty flavour balanced well with the herbs and tomato salsa. The beautiful tomato sauce was thick and rich and packed full of flavour with the additional cooked onion and garlic. The melted queso cheese on top was delicious and balanced the sweetness of the cooked tomatoes and the richer meatballs. We were treated to a delicious array of autumn selections with both cooler and warmer dishes, perfect for any weather that comes around this season. We couldn’t fault a single dish; all the colours, presentations and flavours were beautifully balanced. The friendly, smiling staff and relaxed atmosphere made for an enjoyable evening for all that attended the Autumn Flavours Experience. Beach Bum is a wonderful spot for guests to relax, grab a delicious meal and maybe even celebrate with some cocktails, or two. So take a break with Beach Bum in Brighton and try their unique Hawaiian and Japanese fusion cuisine today.